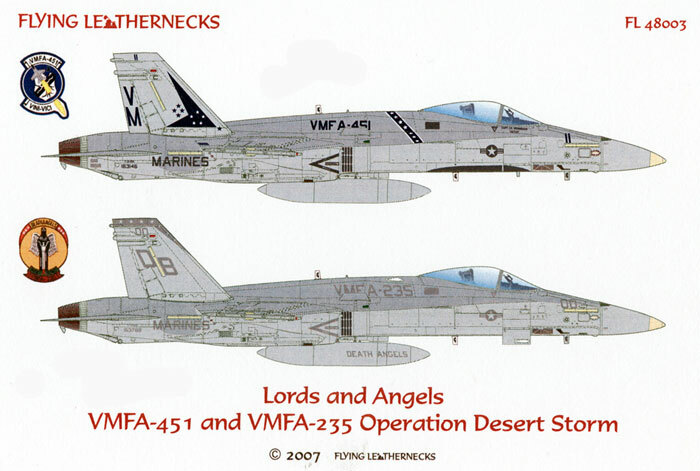 FL48003 - Lords and Angels, VMFA-451 and VMFA-235 (in) Operation Desert Storm is a new sheet from Dave Roof’s company Flying Leathernecks Decals. For those of you not familiar with the name, Dave is a serving member of the United States Marine Corps and a long time Hyperscale contributor. 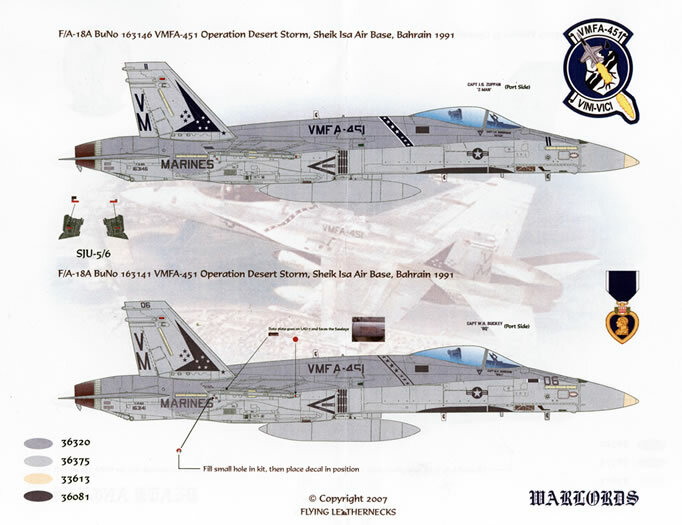 The sheet provides markings for four different United States Marine Corps F/A-18 Hornets, two from VMFA-451 Warlords and two from VMFA-235 Death Angels whilst both squadrons were taking part in Operation Desert Storm during the period August 1990 to March 1991. F/A-18C Bureau number 163769 from VMFA-235 as it appeared whilst it was operating from Sheik Isa Air Base, Bahrain in 1991. The machine is in the standard Tactical Paint Scheme (TPS) finish of Federal Standard (FS) 36320 dark ghost grey over Federal standard 36375 light ghost grey with a tan radome which is quoted as being FS 33613. 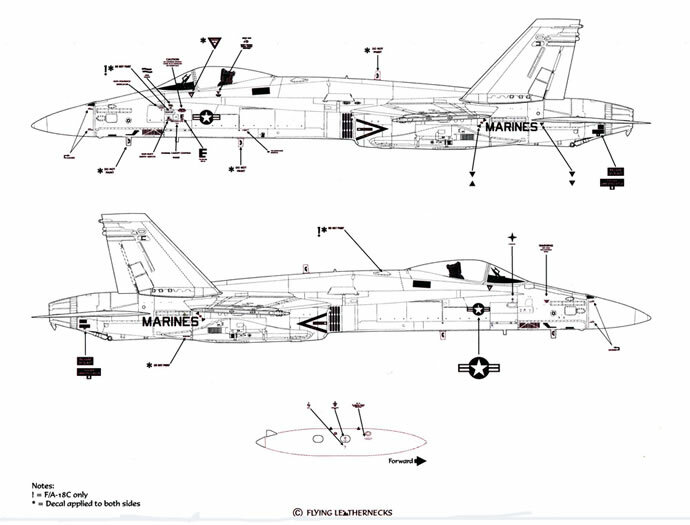 Her markings are all in lo-viz grey and pretty standard for a USMC Hornet with the only striking feature being the distinctive squadron markings on the leading edges of the vertical stabilisers (in the halcyon days of gull grey and white camouflage these squadron markings were red with white stars!). 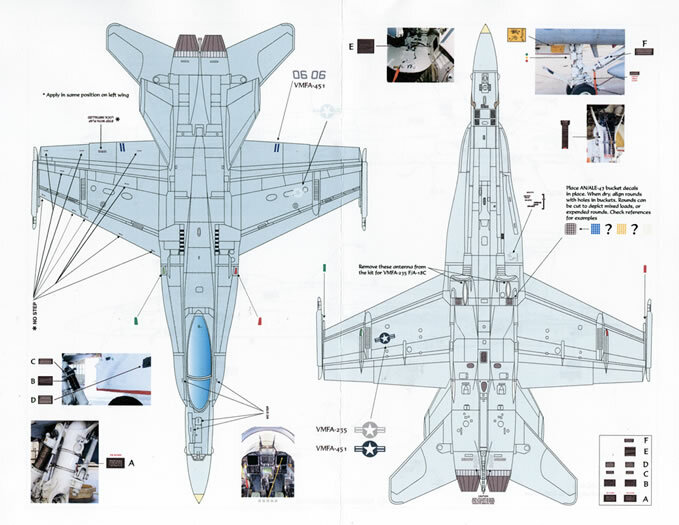 F/A-18C Bureau number 163782, the other VFMA-235 option. This one too is in standard TPS with the same subdued markings as the previous option. F/A-18A Bureau number 163146 from VMFA-451 as it was when participating in Operation Desert Storm in 1991 and flying from Sheik Isa Air Base in Bahrain. The machine is in standard TPS but is a little more colourful that the previous two options as she has her squadron markings in colour. The markings in question are the forward facing “sash” over the spine aft of the canopy and the chevron on the vertical stabilisers. Both these markings are dark blue with white stars with the sash also having a thin white boarder. Her other squadron applied markings are also in the same colour and these include VMFA-451 titles on the spine, VM tail codes and modex (11). The application of coloured squadron markings on a line bird is unusual as these are normally only used on the Commanding Officer’s or Executive Officer’s aircraft (modex 00 and 01 respectively). The aircraft also wears a black-painted false canopy on the underside of the nose. Flying Leatherneck decals have included a vinyl mask assist to you in painting this marking which is a good thing as these things are a real pain to try and mask off properly using thin strips of masking tape! The other Warlords option is Bureau number 163141. This one wears the lo-viz version of their markings as well as the false canopy on the underside of the nose. The machine is also adorned with a Purple Heart ribbon bar on both sides of the nose. Apparently this came about as the machine was damaged by anti-aircraft fire during the course of operations so it was “awarded” a purple heart. The decals themselves are printed by Cartograf. Everything is crisp, clear and in perfect register. You get complete squadron markings for each option as well as two complete sets of stencil data and national insignia. The stencil data is very complete indeed and includes items for the drop tanks, ejection seat, undercarriage, gear doors AN/ALE-47 flare buckets with separate yellow and blue rounds so you can simulate differing loads, lo intensity formation lights (slime lights) and even tiny red and green navigation lights – nice! Support material to guide decal placement is provided via three A-4 sized sheets. 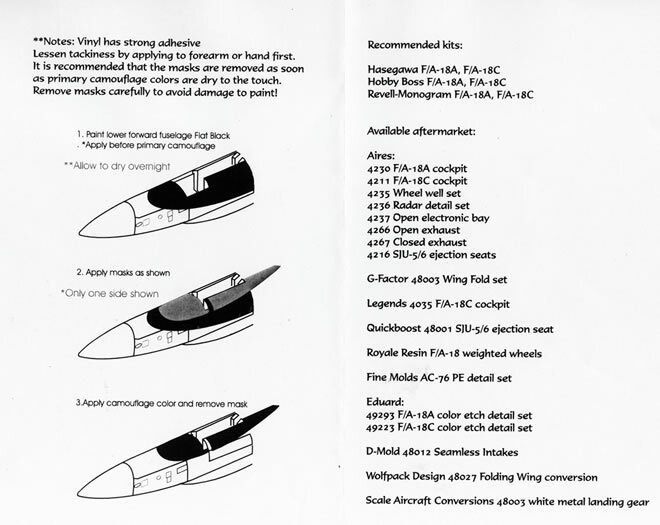 The sheets show left hand side profiles of each option (two to a page), generic upper and lower surface plan views with tiny colour images of the relevant areas of the undercarriage, cockpit and gear doors, black and white left and right hand side profiles (to shoe stencil data placement), a page that lists recommended kits and available after market sets, and finally, a series of tree line drawings to show you how to use the masking set to paint the false canopies of the VMFA-451 options. The decals and support material come packed in a clear plastic zip-loc bag with a stiff cardboard header to save the decal sheet from creasing. 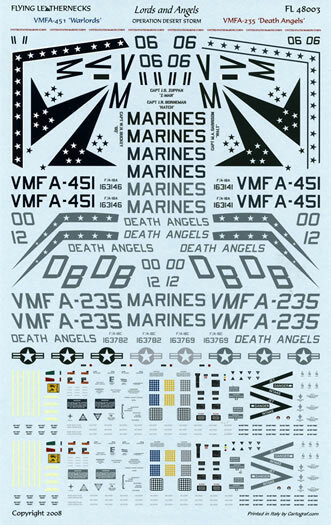 This is a nice product from Flying Leatherneck Decals as far as I am concerned. 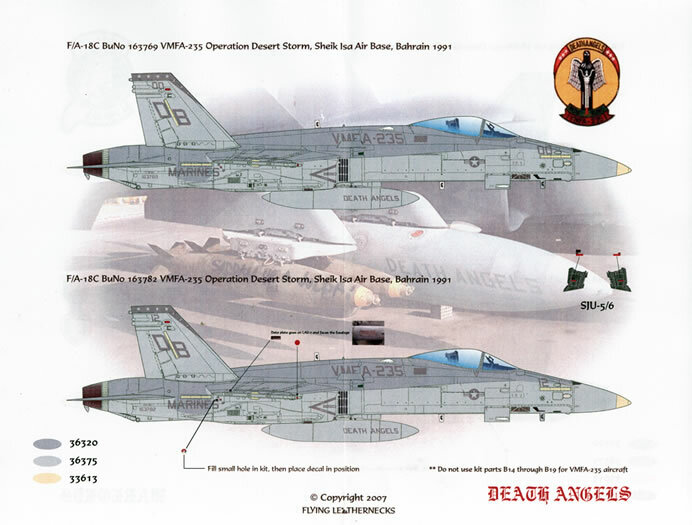 It provides you with top quality decals as well as complete markings for four machines that took part in Operation Desert Storm and some very comprehensive stencil data. advises that the sheet was compiled with the assistance of Craig Sergeant who if you did not know it is “Da Man” when it comes to VMFA-451!